For some 300 years since Henry VIII’s dissolution of the monasteries, tithes in Ewyas Lacy were paid by landholders not only to the clergy of the local parish church, but also to lay tithe owners, people who by purchase or inheritance had the right to tithes as personal income. This study looks at the allocation of tithes to clergy and lay owners in the 1840s, when the Tithe Surveys of each parish gave details of tithe payers and receivers, and distinguished between the two groups of receivers - the clergy and lay owners known then as ‘impropriators’. It will be seen that more than half the Ewyas Lacy tithes went to impropriators. The study also sets out some broader issues in the social context of the time. From time immemorial tithes were a means of income for the clergy and Church establishment. Prior to the Dissolution of Monasteries, most of the tithes in Ewyas Lacy went to Llanthony Priory, and would largely have consisted of produce rather than money, with landholders paying a notional ‘tenth’ of crops or livestock. Local clergy were allowed a portion known as the ‘small’ or ‘vicarial’ tithe, while the more valuable produce, mainly of corn, was the ‘great’ or ‘rectorial’ tithe retained by the Priory. At the Dissolution, Henry VIII disposed of the rights to great tithes in various ways. Some were sold or given to lay impropriators for personal income, and some remained within the Church to be managed by bishops or other dignitaries within the Established Church (at that time the only Church, as Catholics and Dissenters were not tolerated). From the Dissolution onwards, landholders were obliged to pay one or other, or both, of these two sets of tithe owners throughout changes in the religious and political landscape. Increasing freedom of religious expression from the late 17th century included the rapid and widespread growth of Nonconformism in the early 19th century; and pressure to extend the franchise in the early 19th century led to the 1832 Reform Act which reduced the strong hold of landed interests in Parliament. Nevertheless, obligatory tithing remained a deeply embedded anachronism at the time of the 1840s Tithe Surveys, and public hostility to tithing continued to fester for another century until tithes were abolished in 1936. Added to the root-and-branch objections to tithing was a tangle of varied customs throughout the country; some tithes were paid in kind, some in cash and at locally different values. Reform was needed, and legislation in 1836, the Tithe Commutation Act, introduced a standard rate of payment based on land values for individual properties, assessed in Tithe Surveys of all parishes in England and Wales. In Ewyas Lacy, tithes were no longer paid in produce by the late 18th century at the latest, but had been ‘commuted’ to cash. This transfer is dramatically recorded in a court case of 1806 : a stone memorial plaque in Clodock Church records a law suit which four local farmers won in favour of cash payments, against the vicar who wanted payment in kind to be retained. Such law suits were not uncommon. Cash payments were preferred by tithe payers: they were a fixed amount year after year, and as they did not increase with inflation, the value of cash payments diminished over time in relation to the value of produce. The great tithes of Llanthony Priory were initially bought by Nicholas Arnold at the Dissolution, and sold in 1720 by his descendants to the Harley family of Brampton Bryan in north Herefordshire . In 1804 Edward Harley, 5th Earl of Oxford, sold the Ewyas Lacy tithes by auction, with the greatest bulk going to Sir George Cornewall of Moccas Court in Herefordshire . By the time of the 1840s Tithe Survey, a later generation in the Cornewall family still owned by far the largest share, though there were other impropriators on a smaller scale. These may have been purchases by individual farmers for tithe rights on their own land: Duncumb notes that Harley ‘disposed of some of them [the tithes] to the proprietors of the soil’ , and there may have been other piecemeal purchases, or possibly exchanges of land for ownership of tithe rights. The Tithe Surveys show the tithe assessment on each field and has separate columns for the shares payable to the clergy and impropriators . This level of minute detail is brought together in a summary for each property, where the annual tithe is reckoned in pence for a cottage, a few pounds for a modest farm and rarely reached ten pounds or over. From the totals for each of the ten parishes, the overall picture for the whole of Ewyas Lacy shows that the allocation of tithes to the local clergy was about 44%, and to the impropriators about 56%, as shown in Table 1. Of the impropriate tithes, the share held by Sir Velters Cornewall was by far the largest. However, this overall total disguises a variation between parishes, as shown in Table 2, where the percentage columns vividly illustrate huge differences of allocation. There are no ready answers for variation in the parish profiles, and a full study would require looking at land ownership as well as tithe ownership of individual properties, and in some cases even field-by-field patterns of tithing, at a level of detail far beyond the scope of this study. Briefly, though, it can be noted that usually both vicarial and impropriate tithes were charged on each field, and sometimes either the vicarial or the impropriate but not both. The Tithe Survey shows the amount for each and every field and can be consulted for this level of detail. Some headway, however, can be made into the role of tithes in the social setting by looking more closely at the three categories of recipients: the clergy, the Cornewall family and other impropriators. These groupings will be considered in turn as the subject of this study. Delving into the financial arrangements of 19th century clergy is like stepping into Anthony Trollope’s series of novels, the Barchester Chronicles, where the characters are much exercised with the minutiae of clerical stipends. For our purposes, a distinction can be made between rector, vicar, curate and perpetual curate, as each of these roles involved a different source of income or tenure. A rector was responsible for parish ministry, though this might be delegated, and was entitled to the great tithes. A vicar was also responsible for parish ministry, though again not necessarily in person, and was entitled to the small or vicarial tithes, from which he might pay a curate as assistant. The notional poverty line for vicars has been estimated at £150 per year in the early years of the 19th century, and the going rate for a curate £50 (the curate himself having no entitlement to tithes, and many were impoverished). A vicar would usually receive additional income from a patron and possibly from independent means, and perhaps by taking in pupils. A perpetual curate had a similar standing to a vicar as parish priest, generally performing the ministry himself, but held this position in his own right which was not transferable: his income could be from vicarial tithes, independent means or from a patron. In terms of social status, a rector typically belonged to the gentry, or even aristocracy since younger sons often took holy orders, while a vicar or perpetual curate could also mix with the gentry though perhaps not always so comfortably. A rector and vicar would normally be university educated. A curate might be a young novice with aspirations to any of these positions, but otherwise at a more advanced age might be a parish workhorse without prospects. ‘Pluralism’ whereby clergy held more than one parish was common. Sometime churches were too far distant from each other for regular to and fro, which led to a high level of absenteeism much decried by church authorities. However, the grouping of churches in neighbouring parishes with reasonable access to each for shared ministry was also common. Both practices can be seen in Ewyas Lacy. What emerges from the pattern of ministry is that all the principal clergy, whether rector, vicar or perpetual curate, are likely to have received a substantial part of their income from sources other than tithes. Table 3 gives details of the clergy officiating at around 1840. The churches are grouped according to the priest in charge, who will be identified in more detail in discussion below. After a curacy of two years in Clodock, Charles Proberts was vicar of Clodock from 1833 until his death in 1884. He lived at the vicarage in Longtown (demolished in the 1960s and replaced with a new building). He was responsible for the churches then known as ‘chapels’ in the three townships of Craswall, Llanveynoe, and Longtown. From 1839 he was also rector of Bacton. The Ewyas Lacy chapels were served by two perpetual curates, William Rowlands at Longtown and Llanveynoe from 1816, and Thomas Thoresby at Craswall from 1831. William Rowlands was paid £50 pa by the vicar of Clodock as his patron, and possibly Thomas Thoresby as well, though this is not clear. Thoresby also served at two other churches in Radnorshire and Breconshire. Newton township was without a chapel until a new one was completed in 1844: the perpetual curate JW Jenkins, appointed in 1847, was funded by the Ecclesiastical Commission at £80 pa, and the vicar of Clodock may have made a contribution. The patron of Clodock church was Walter Wilkins, esq, of Maeslough Castle in Radnorshire and a member of the prominent de Winton family, who is likely to have supplemented the vicar’s income, as is suggested by the role of his father as patron in 1814 . David Rodney Murray was vicar of Michaelchurch Escley and St Margarets from 1827, at which time Morgan Jones was curate, and was rector of Cusop from 1835, with RD Palmer as curate. Murray was related to the Harley family by marriage, and lived at Brampton Bryan (in north Herefordshire) where he was rector. He is likely to have had a substantial income. The status of Morgan Jones has not been fully researched as yet: he was described as ‘curate’ in 1827 when he was resident in Vowchurch, and ‘incumbent’ in 1835. The tithe survey does not name him but gives an allocation of the vicarial tithe to the ‘perpetual curate’ of Michaelchurch Escley and St Margarets. It seems probable that this was his position in 1840, with the Earl of Oxford as his patron. John Morris became perpetual curate of both Rowlestone and Llancillo in 1803 after a purchase of the ‘advowson’ (the right to nominate a clergyman) by his predecessor the Reverend Philip Price, who had bought it from the Earl of Oxford. After the death of Philip Price the advowson was leased to John Morris, who later bought it for himself in 1829 (thus becoming his own patron) and continued as perpetual curate living at the vicarage in Rowlestone. A collection of documents relating to financial transactions for the advowson, dating from 1801 to 1944, throw an interesting light on this form of ecclesiastical tenure . In 1830 Theophilus Morgan followed his father Morgan Morgan as vicar of Walterstone. This was a shared ministry with Oldcastle and Cwmyoy; Morgan was also also vicar at Oldcastle and curate at Cwmyoy, while Peter Jones Lewis was incumbent at Cwmyoy and curate at Oldcastle. Theophilus Morgan lived at Glan Honddu House in Llanfihangel Crucorney. His patron was Edmund Higginson of Saltmarshe Castle near Bromyard, who owned a number of other prestigious properties in that area. These brief notes suggest that the principal clergy of Ewyas Lacy were not impoverished. Most were able to employ support clergy, and one (the perpetual curate of Llancillo and Rowlestone) was able to purchase his own advowson. However, the tithe allocation shown in Table 3 shows that they would not have been able to make a living or pay support clergy without additional income. With or without their own personal approval, all depended on private means or patronage in addition to tithes: this was the reality of clergy income. Table 4 shows the total income for the principal clergy in each parish. Most of it is for vicarial tithes, but there are also some allocations of great tithes: in St Margarets an allocation to the vicar of Clodock may represent the vicar’s private ownership of tithe on a particular property rather than a stipend for ministry in St Margarets ; in Walterstone all the tithes went to clergy, about half being vicarial tithe going to the Walterstone vicar and the other half being great tithe to the perpetual curate of Rowlestone and Llancillo; and in Cusop the rector received all the tithes by virtue of his rectorial right to great tithes. The Tithe Survey shows that the Cornewall family owned 82% of impropriate tithes in Ewyas Lacy, and other impropriators 18%. The tithes of Ewyas Lacy were auctioned in 1804 by Edward Harley, Earl of Oxford, at Garways Coffee House, Change Alley in London. The sale particulars note ‘the Tythes of Corn, grain, wood and lands of upwards of 20 thousand acres of land of which 3577 acres are at present in tillage’ . Prospective buyers would have understood that the tithes were not actually of produce but that these terms were the equivalent of great tithes. The yearly value was stated to be £570. It may have been at this sale that George Cornewall, esq (later the 3rd baronet) contracted to buy the lion’s share, though negotiations over details continued by correspondence for several years . Other impropriators possibly bought portions at or around that time by arrangement with Edward Harley: as Duncumb notes, Harley disposed of some tithes to ‘proprietors of the soil’, possibly before the auction took place. Sir George Cornewall, the 3rd baronet, died in 1835, and in the Tithe Survey the Cornewall interest is represented by ‘receivers’ on behalf of his estate and his son, Sir Velters Cornewall (1824-1868) who as inheritor was still a minor when the surveys were conducted . The receivers were Sir George’s three brothers-in-law, Sir Thomas Frankland Lewis of Harpton Court in Radnorshire, the Reverend Gilbert Frankland Lewis, rector at Monnington on Wye, and Samuel Peploe, Esq of Garnstone Court in Herefordshire, who are variously named as impropriators in all the Ewyas Lacy parishes except Cusop and Walterstone. In Table 5, an account of tithe receipts from Ewyas Lacy in 1839 gives headings apparently derived from the pre-dissolution inventory by Llanthony Priory. While some of the headings correspond with parish names (including Kenderchurch, not in Ewyas Lacy by the 1840s), others are more local place names, some of which are known in other documents to refer specifically to tithe barns , including ‘Bury’ barn, Turnant barn, Olchon barn. Other tithe barns are implied at ‘Netherescley’, Oldcourt and Trewern among other locations. This inventory of tithe payments suggests, therefore, an ancient geographical division where tithe barns were collecting points for tithes in kind and remained as headings in the accounts long after tithes were commuted to cash. A significant feature of Table 5 is a shortfall in payment in every locality, as well as huge differences in the percentage of shortfall between localities. Of course, the number of payers and amount of land in each parish varied, but even so, a shortfall in one year of about one third of the amount due, and an accumulated shortfall of about 40% does not seem an encouraging return. However, the amount actually received, over £400, was itself substantial. In addition to the Ewyas Lacy tithes, the Cornewalls held tithes elsewhere near the family seat at Moccas Court. Table 6 lists the full portfolio. These data come from the Tithe Survey, several years later than the accounts above, showing that the new assessment of tithes, based on a nationally standardised rate, gave them a larger allocation from Ewyas Lacy and that their total investment in tithes could potentially bring an annual income of about £1,000. It is interesting to note that the Home Secretary writing to Grove was none other than Sir George Cornewall Lewis, cousin of Sir Velters Cornewall of Moccas - the major tithe owner in Ewyas Lacy. There were 30 impropriate tithe owners other than the Cornewalls in Ewyas Lacy parishes. They form a mixed group, apparently at different levels of social status and with different property interests. About half the other impropriate tithe owners were owners and occupiers of the property on which they owned the tithes. Most were yeoman farmers with freeholds or copyholds (leases that were renewable and inheritable), and for most, too, the farm was the family home and their main or only property, generally less than 150 acres. Among this group of tithe owners are those who reportedly (according to Duncumb) bought tithe rights directly from Edward Harley when his sale gave them the opportunity. In any case, whether then or at another time, the fact of their ownership raises a question of why they took an initiative. It may represent a purely financial interest in ridding themselves of a tax burden, but there were also powerful currents of hostility to tithes from religious dissent and political disaffection: small scale tithe owners may substantially be those opposed to tithes in principle. Another means of ownership was to acquire tithe rights by exchanging land, which is usually associated with the enlargement of enclosed land by major landowners. There is no evidence that this happened on a significant scale in Ewyas Lacy, given the generally modest scale of farms. Very few smaller scale impropriators lived outside Ewyas Lacy, which strengthens the impression that smaller scale tithe owners were local farmers whose interest was primarily to acquire tithe rights on their own land, not investors from outside. The largest individual shares of tithe ownership (other than that of the Cornewall family) was in Llancillo and Rowlestone, where John Lucy Scudamore owned tithes on about 800 acres, and in the same parishes James Gilbert Price on about 640 acres. For each of these tithe owners, the land they owned covered broadly the same area, which again suggests that each had acquired the tithes to consolidate his property interests from both land and tithes, though on a larger scale. Of the two, only James Gilbert Price lived locally, at Llancillo Hall with a farm of about 187 acres. The Scudamore family of Kentchurch Court (within some five miles) held property in Llancillo and Rowlestone for many centuries and some members of the family had lived there in the past, though not by the 1840s. The Scudamores probably bought tithes at around the time of the 1804 auction . A sizeable portion of tithes was still owned by the Cornewall family, more so in Rowlestone than Llancillo. Tithes are a puzzling feature of social dynamics in the 19th century. Embedded in the medieval ideal of pastoral care by the parish church, they survived into the 19th century as a relic of paternalism coupled with social deference. However this purpose had become distorted: not only had tithes become a largely secular tax, they were also largely private income. Would-be reformers abounded from many quarters of religious and political opinion, but compulsory tithing continued long after its notional benefits had shrunk almost to vanishing point. In Ewyas Lacy there is no record of the complaints that must have been routinely aired in ordinary day-to-day talk, but there is some evidence that tithing was actively resisted. The court case at Clodock was the culmination of many years of grievance on both sides between the vicar and some parishioners, and it was the parishioners who initiated a law suit. The ownership of tithes by a few small-scale farmers suggests that at least some sought a release from tithing on principle, for some probably on the grounds of religious dissent at a time when non-conformists were flourishing . Another sign of resistance was simply default or delay in payment, which appears to have been rife in this area where tithe collectors had to contend with a dispersed population, hilly country and poor roads, let alone the many stratagems for stalling that can be imagined. On the other hand, there were forces which promoted acceptance of the system. What today we know as ‘local government’ began with functions carried out by the parish church. From Elizabethan times the church was made responsible for administering the Poor Law and for maintaining roads and bridges, and for collecting local rates for these functions. Later, the compulsory registration of births, marriages and deaths was carried out only by the parish church. In the 1840s there was no clear distinction between the civil and religious functions of the church: ‘parishioners’ were all the people living in the parish, and the parish ‘vestry’ was the body of landholders responsible for carrying out the duties imposed by law, regardless of their personal views on matters of religion or politics. The parish was required to act as a community in meeting these civil functions. Another cohesive factor in the social ethos in the mid 19th century was a dependency of small communities on the good will of the gentry. It made sense economically for small-scale famers not to fall out with the gentry, or at least not so seriously as to threaten their own livelihood or prospects. Although few gentry lived in Ewyas Lacy, their prestige and influence in the market place would have been well recognised, as also their legal clout in public offices such as MPs, magistrates, and justices of the peace. The Cornewall family were a significant power base major landowners, and networks of their family relationships with varied public roles extended across Herefordshire and the Welsh border. In this situation, there would have been little motivation for reform, no matter how irksome the payments were felt to be. In sum, this case study opens a window on a form of taxation that had long outlived its original purpose. A far reaching consequence of Henry VIII’s windfall was to transfer great tithes into an accepted form of secular income. To the modern mind it seems remarkable that compulsory tithes continued for so long after such a large proportion had lost a religious underpinning. Duncumb, John (1812). History and Antiquities of the County of Hereford, Part I Vol II, p279 [rs_dic_0107 ] for Clodock, and see other sections of Duncumb’s history for other Ewyas Lacy parishes. The Tithe Survey for Herefordshire parishes is housed at Herefordshire Record Office. For each parish, the ‘apportionment’ (an inventory of details about properties) and the tithe map showing their locations is available on microfilm. Sections of the Ewyas tithe maps with the names of owners and occupiers can be seen on this website [nwgc_ewy_3000 ]. HRO: J56/III/106 is a packet of valuations, receipts and correspondence between Cornewall and Harley and their respective agents concerning the amount of land covered in the purchase of Ewyas Lacy tithes, and arrangements for a loan to Cornewall to cover the purchase price. Table 4 is an extract from HRO: B89/1/3, p76-7giving a summary of Eywyas Lacy tithes. 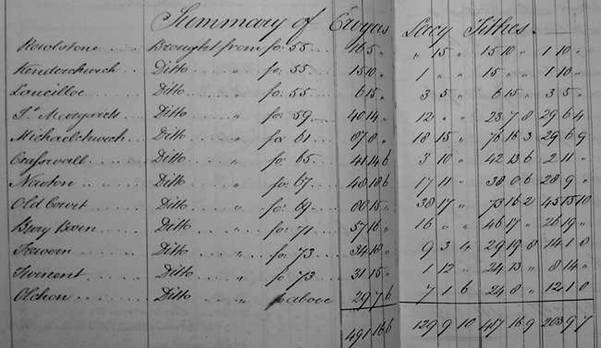 This document is a bound ledger of accounts for individual properties, covering all the tithes owned by the Cornewalls in 1839. Source for Table 6: Tithe apportionments for the Ewyas Lacy parishes. The schedule of impropriate tithe owners at the beginning of the apportionment sometimes differs somewhat from the final summary. The data on property acreages in Table 6 are drawn from the final summary.